Work Order Inquiry is an interface that provides work order header information as well as current production progress. Current production progress, like Complete Quantity, Scrapped Quantity and Last Production Date, will be updated whenever a transaction for this work order is created. 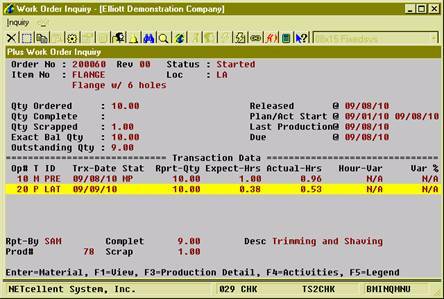 Also, this interface displays routing, bill of materials and production transactions for the work order in different views and drill downs are available for more detail. A work order number must be specified unless you have drilled down to Work Order Inquiry from another interface, ex. Sales Order Inquiry. All the information about the work order will be displayed. Basic information from the work order header will be displayed on the top four lines, including item number, production location, order status and revision number. If this work order was copied from a COP order, sales order information will be displayed on the top-right side. The middle of the screen displays numeric statistics about the order, including quantity ordered, quantity completed, balance quantity, planning start and due dates, and actual start date. “Balance Qty” is for orders where the ordered quantity is not an exact quantity. “Exact Bal Qty” is for orders where the order quantity is an exact quantity. Balance Quantity of an order is the difference between quantity ordered and quantity reported. If order quantity is an exact quantity, balance quantity is ordered quantity minus completed quantity. Otherwise, balance quantity is ordered quantity minus completed quantity and scrapped quantity. “Outstanding Qty” is the number of pieces that have been started but not yet finished. Below the numeric statistics is a view of the work order. 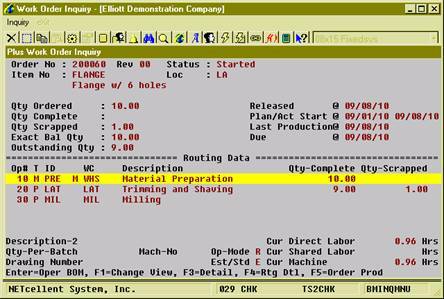 Like many other interfaces in WO+, Work Order Inquiry has three views, Routing View, Bill of Material View and Production Transaction View. Use the F1 Key to toggle between these views. This view shows all operations in the routing of the work order. The system will display detail information of one operation on the bottom of the screen. The current quantity of each operation will appear to the right of each operation line and the hours will appear on the bottom-right. Use Up, Down, Page Up and Page Down to navigate the highlighted bar. Use the Enter Key to drill down to the bill of material of one material issued point operation. The system will display an “M” on the left of the operation’s Work Center to identity material issued points. Use the F1 Key to toggle to another view. Use the F2 Key to drill down to Sales Order Inquiry if the Work Order was copied from COP. Use the F3 Key to drill down to Production Inquiry by Operation for more details. Use the F4 Key to bring up the Order Routing Inquiry for more detail. 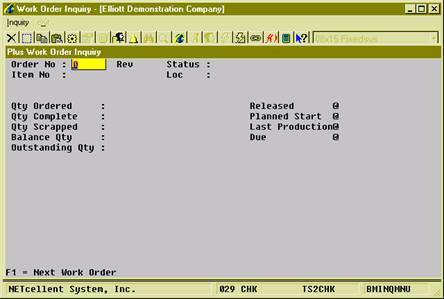 Use the F5 Key to bring up the Production Inquiry by Order screen. Bill of Material View displays all components planned to be used or already used to produce the parent item. Each line displays one component and the quantity to use in the work order. If the component has been issued, the system will show the quantity used during the production. If one component was used in 2 or more operations, the system will consolidate the different operations into one record and display an asterisk “*” to the left of the item number. Use the Enter Key to drill down to Stock Status Inquiry for the highlighted component. Use the F3 Key to bring up serial numbers created for the parent item. Use the F4 Key to bring up serial numbers issued for the highlighted component. 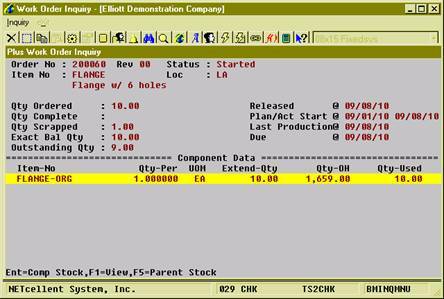 Use the F5 Key to drill down to Stock Status Inquiry for the parent item. Production Transaction View displays all reported production transactions, posted and unposted. The system will display reported quantity, which is the sum of completed quantity and scrapped quantity, of one transaction. The expected labor hours and actual labor hours are displayed as well. If the operation uses standard value, instead of estimated, the hour variance will be displayed on the right of each line. Use the Enter Key to bring up material issued for this transaction. Use the F3 Key to drill down to Production Detail if this transaction was created through a scanning interface. Use the F4 Key to drill down to Production Activity Inquiry if this transaction was created through a scanning interface. Use the F5 Key to bring up the legend.